Subtle system The human subtle system is a vastly intricate one, made up of thousands of channels which carry energy throughout the body. The concentrations of the energy in the subtle system are called chakras (“wheels” in Sanskrit), or energy centers. 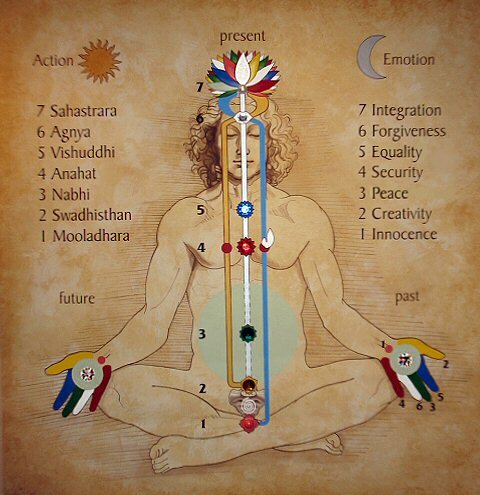 The entire system is governed by three primary vertical channels of energy and by seven main chakras. Our subtle system is fully activated only with the awakening of the Kundalini, which cleans and balances the entire system and enlightens the pure qualities of the chakras within us. Chakras There are 7 major chakras in our subtle system which are responsible for our physical, emotional and spiritual well-being. Their names are: 1. Mooladhara chakra (Root chakra) 2. Swadisthan chakra 3. Nabhi chakra 4. Anahat chakra (Heart chakra) 5. Vishuddhi chakra 6. Agnya chakra 7. Sahasrara chakra (Crown chakra) When the Kundalini is awakened, she starts cleansing and enlightening these chakras. Thus, the qualities of these chakras begin manifesting in our daily lives, making us more balanced and integrated. In the diagram, the energy centers (or chakras) are shown as circles in different colors, aligned with the spinal chord. This awareness of the energy centers provides us with a tremendously objective view of ourselves. We don’t “think” that we have this or that problem, but we can actually feel the source of our problems on our fingertips. We have a great capacity to rationalize our experiences, to justify our actions through the power of our mind. Through this vibratory awareness which we gain through Sahaja Meditation, we are able to use a much more reliable measure of our inner state. In short, we begin to “know ourselves.” Amazingly, every problem that we have, whether it is physical, mental, emotional or spiritual, can be related to disturbances, also known as “catches”, on these energy centers. In the picture on the right you can see that the colors shown on the hand correspond to the colors shown on the chakras. For example, the thumb is in yellow and this corresponds to the color of the second energy center at the base of the green circle in the subtle system chart. Further, if we are able to cleanse these energy centers, also called “clearing”, we can actually cure these energy centers. A number of articles have been published in scientific journals to demonstrate that Sahaja Meditation works effectively when this approach is used. Kundalini The Kundalini is shown as a coil between the red and yellow energy centers, indicating its potential state. It lies dormant in every human being until awakened, at which point it travels through the energy centers and pierces the fontanelle on the top of our head. Interestingly, fontanelle means “little fountain.” When this happens, the person has achieved the state of Self-realization. I have read all the information listed above, but I have some questions! Please check the support forum first. You can either post a question on the forum or send it to us through the contact form. I am doing OK, I want to go to the next part! Please click here to go to the Guided Meditations.